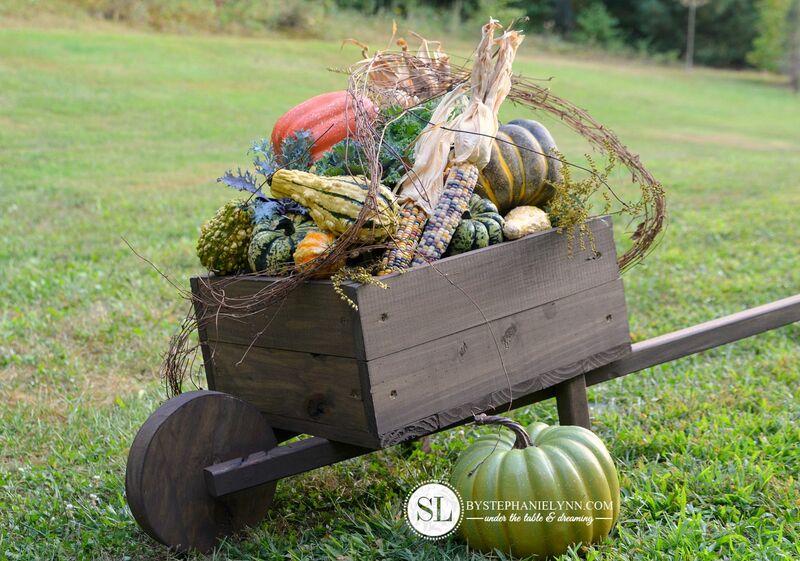 While we have been working on sprucing up the yard the past couple of weeks – I decided a wooden wheelbarrow would create the perfect home for displaying all of these gathered fall treasures. Since we wanted the wheelbarrow for an outdoor display, treated lumber was used for the construction. 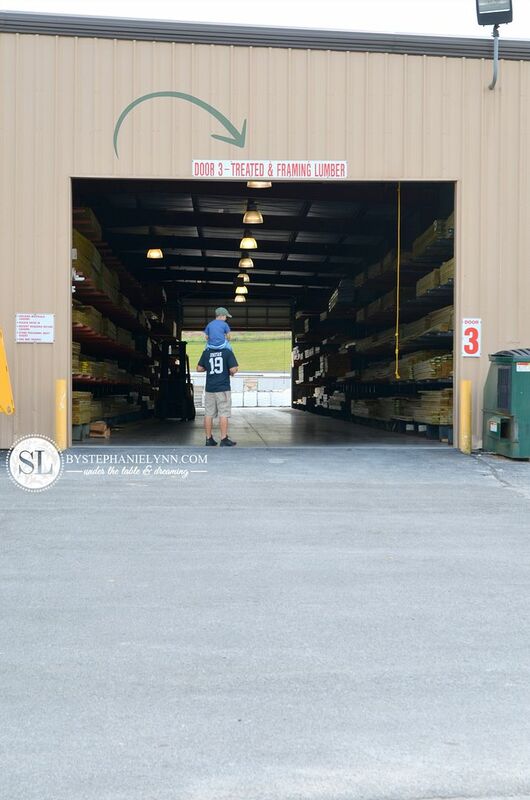 Pressure treated lumber undergoes a process which forces a preservative deep into the structure of the wood providing long term protection against rot, decay and termites. 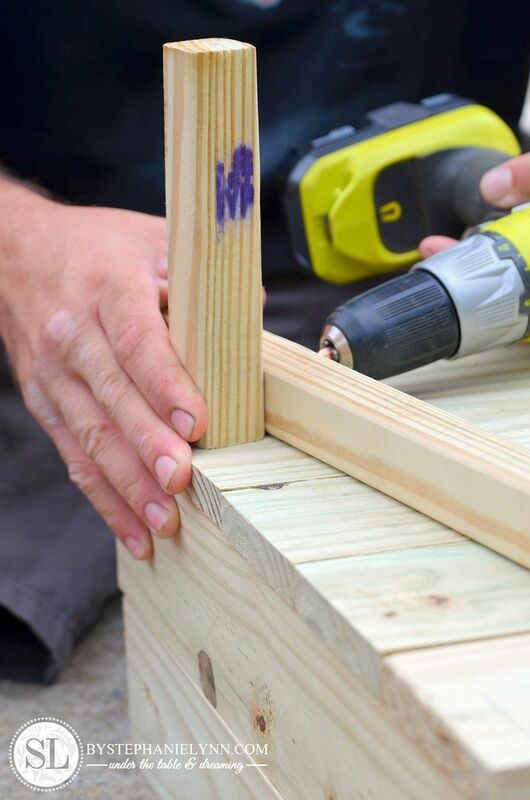 Exterior wood screws should also be used. These are specifically rated to be used for pressure treated wood can be found with a protective coating on them to prevent rust and corrosion. 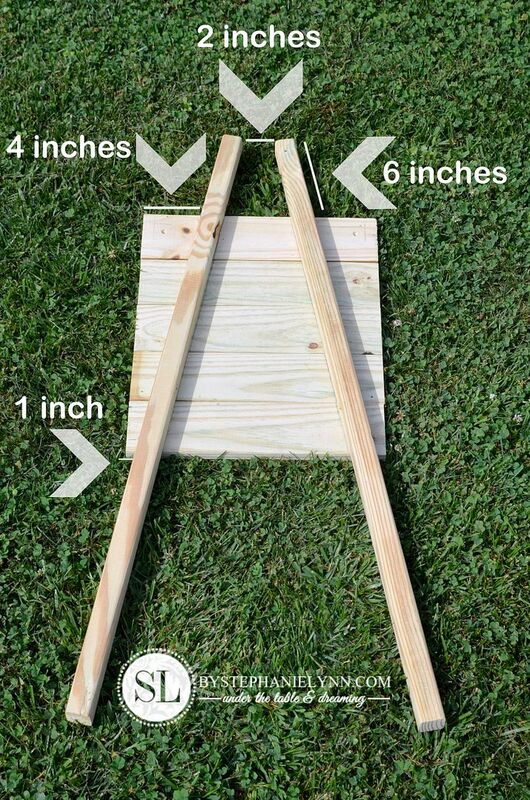 Step 1: Cut the pressure treated lumber for the wheelbarrow base as detailed in the cut list above. The five 1 X 4 X 15 inch pieces make up the base and the two 2 x 2 x 41 inch pieces are for the support handles. Step 2: There are two different options for the wheel. If you have a band saw or scroll saw available, the instructions below give you the details on how to make your own – however a pre-purchased wheel can also be used. 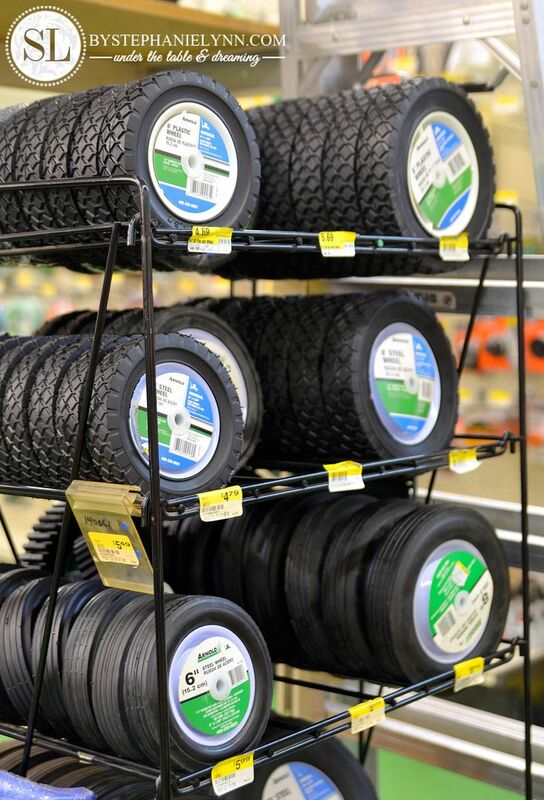 Our local True Value carries several different sized lawn mower replacement wheels which would work perfectly. If you go this route, look for an 8 inch X 1.75 inch wheel to fit with these particular wheelbarrow plans. 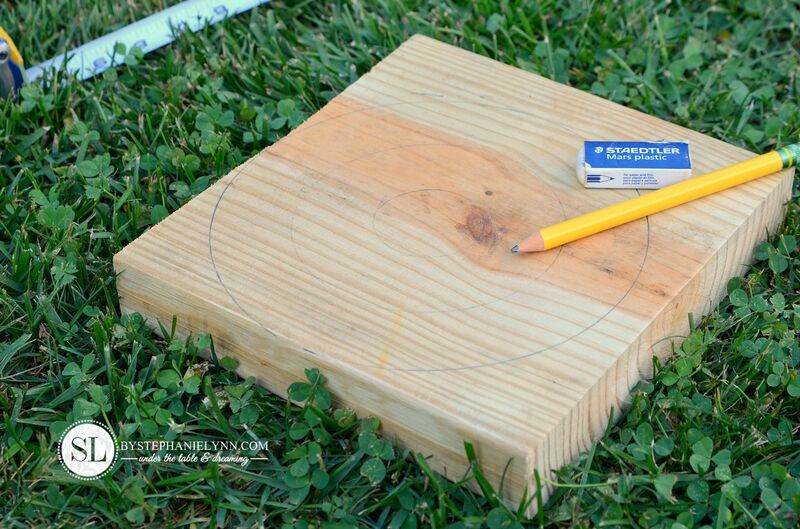 To make your own wooden wheelbarrow wheel, draw an 8 inch circle onto a piece of 2 X 10 pressure treated lumber. 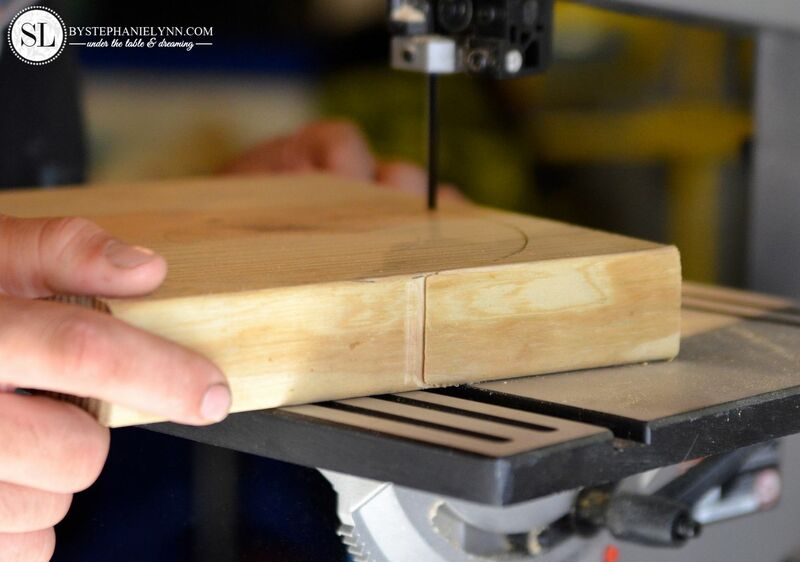 Using a band saw (or scroll saw) cut the circle out. 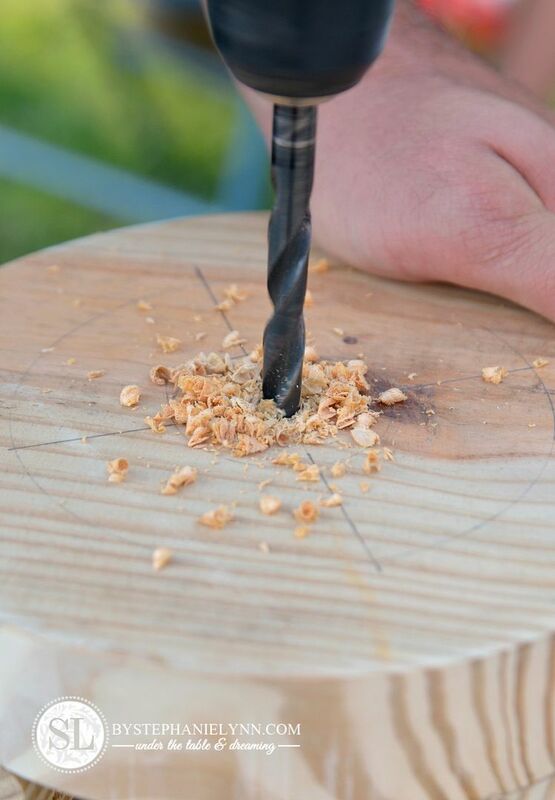 Using a 1/2 inch drill bit, drill a hole into the center of the wheel. 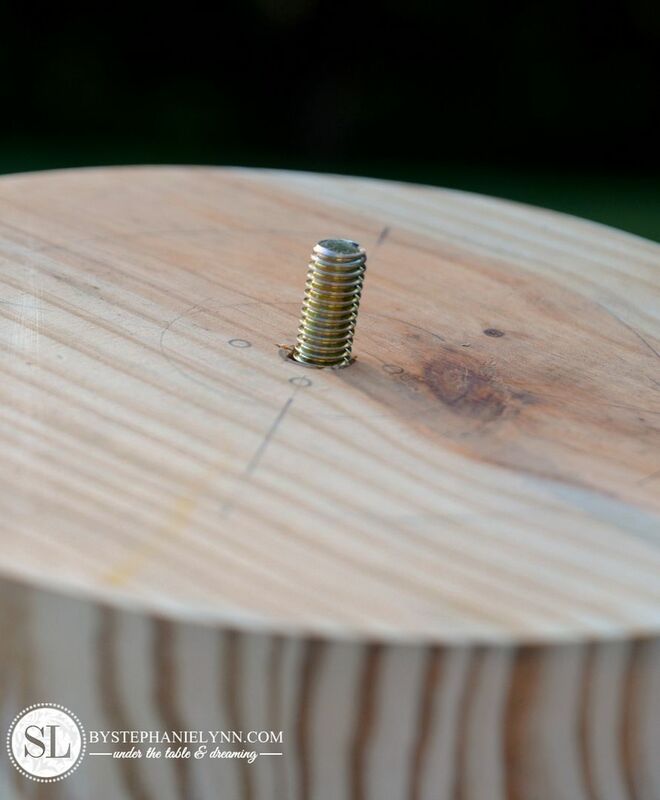 Step 3: Place the threaded rod through the center hole of the wheel. This will become the axle of the wheelbarrow. If you are using a pre-purchased tire the center hole is typically a 1/2 inch in diameter, in which case the 3/8 inch threaded rod would work. 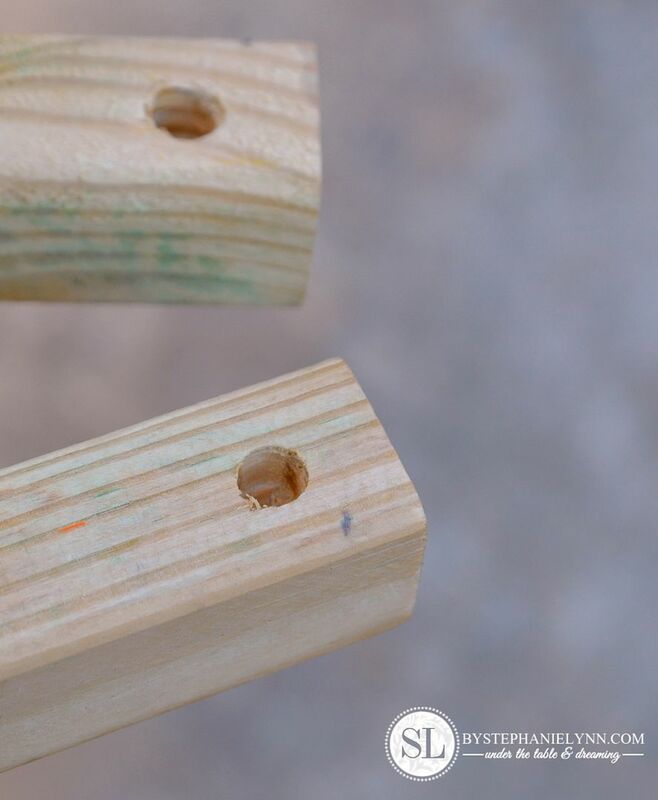 Step 4: Using the same 1/2 inch drill bit, drill two holes in the end of the 2 X 2 support handles. The holes should be 3/4 inch from the end and should only be drilled about 1/2 inch deep. Do not drill all the way through the 2 x2. Step 5: Assemble the wheel and axel to the support handles, as shown above. 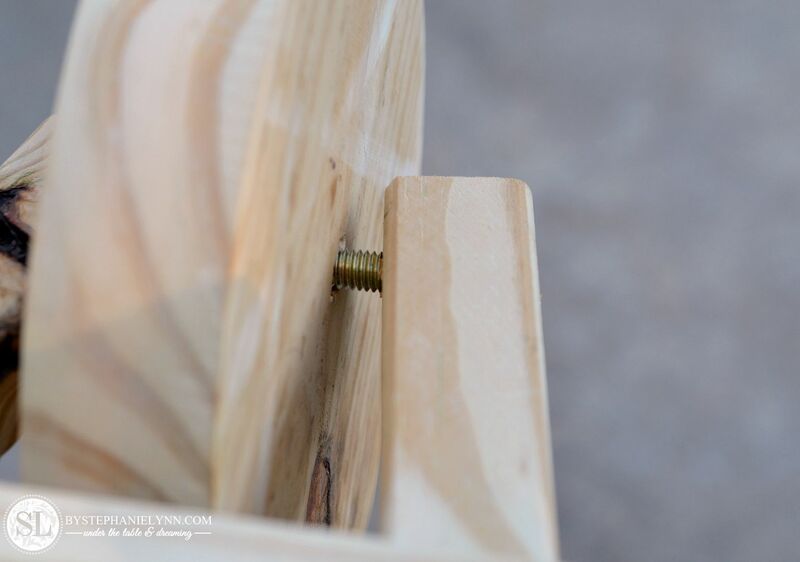 The support handles should pinch the threaded rod and hold it in place once the wheel barrow boards are assembled. 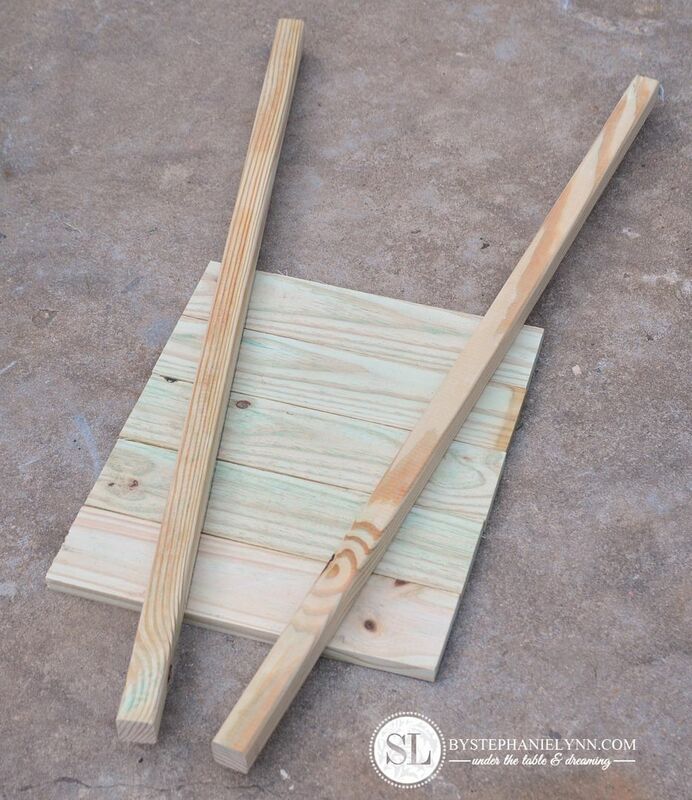 Step 6: Screw the wheelbarrow base boards in place. Refer to the photo above for the board placements. Note: the wheel and axle should be in place prior to securing the boards. The based boards should be screwed into the support handles from the top. 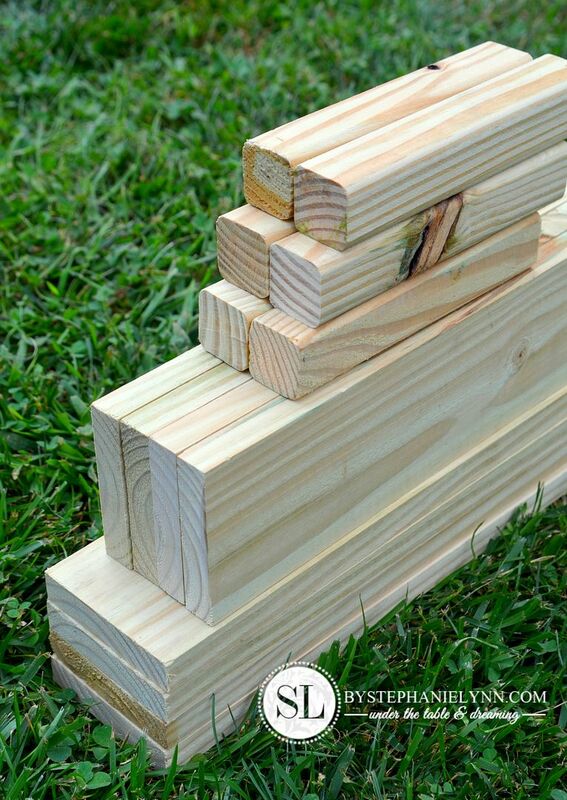 Step 7: Cut the remaining pressure treated lumber for the planter box as detailed in the cut list above. 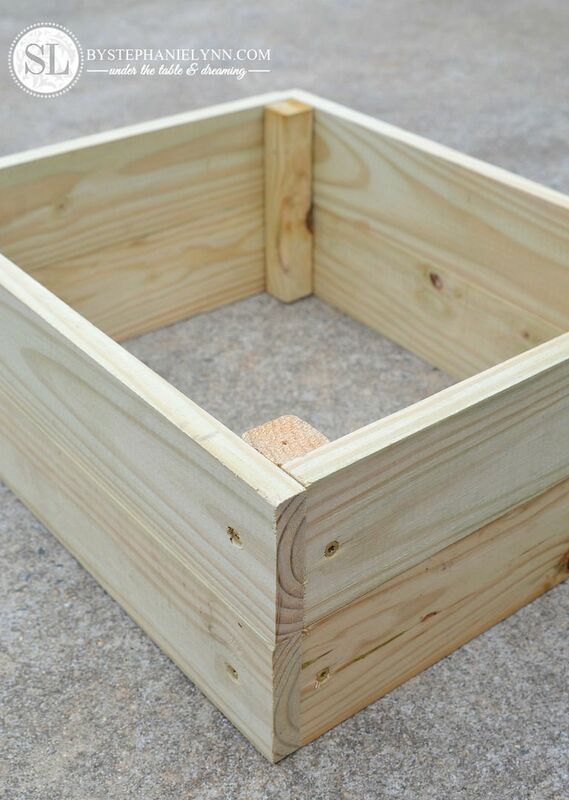 The four 1 X 4 X 13 1/4 inch pieces along with the four 1 X 4 X 18 inch pieces make the planter box. Four of the 2 X 2 X 8 inch pieces will be used for the corner supports and the other two 2 X 2 X 8 inch pieces will be used for the legs. Step 8: Begin constructing the planter box by squaring up a 13 1/4 inch piece and an 18 inch piece of lumber. 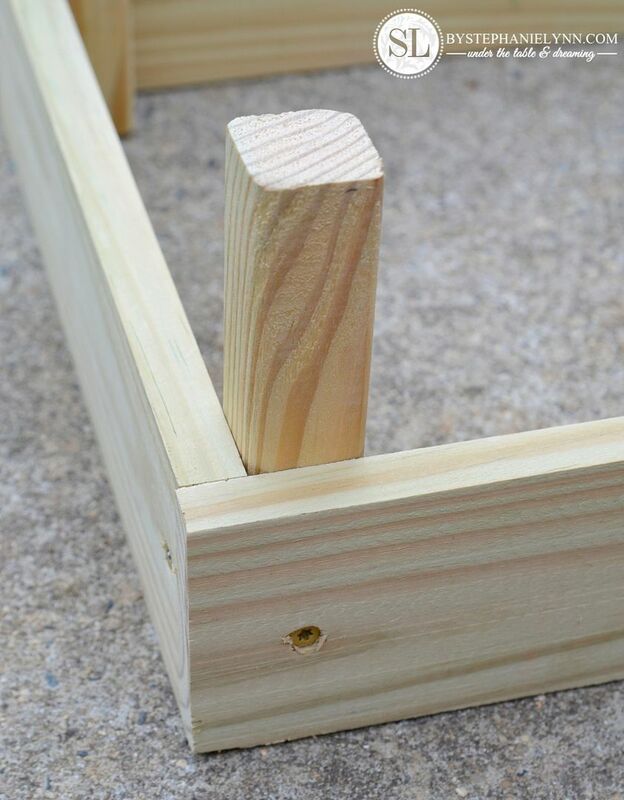 Place the 2 X 2 support in the corner and screw together, as shown above. Once all four corners are complete your planter will look like the photo above. Step 9: Complete the planter box by screwing on the second set of rails. 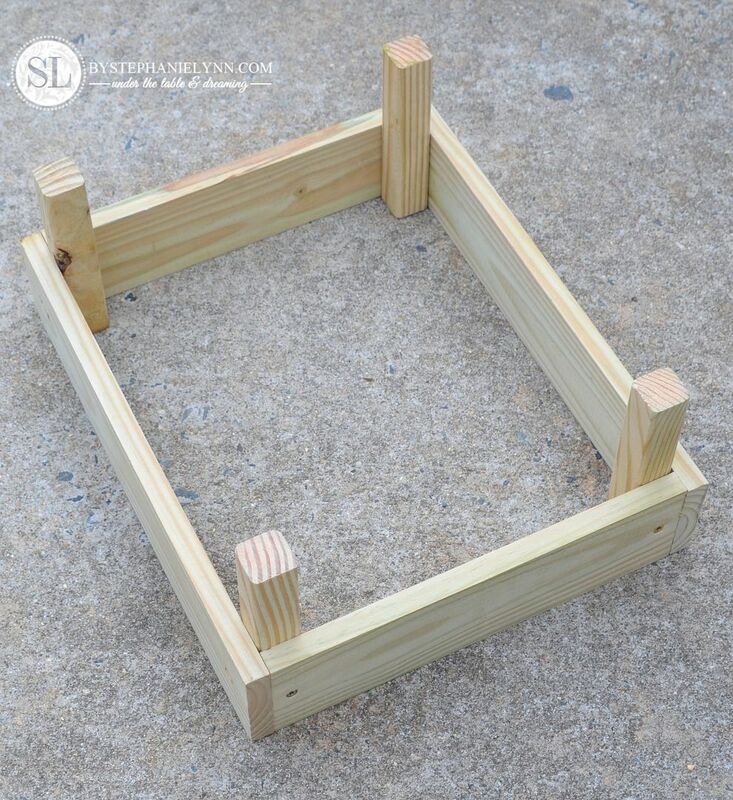 Step 10: Place the wheelbarrow base on top of the planter box and secure together by screwing each corner down. Step 11: Add the last two 2 x 2 pieces for the legs. Note: The photo above is of the bottom of the wheelbarrow. 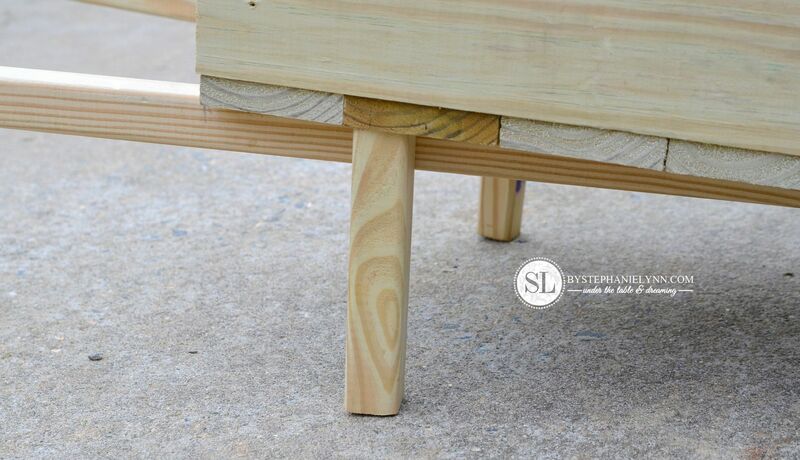 Line each of the legs up with the first seam of the 1 X 4’s, as shown above. Then screw into place from the support handle. 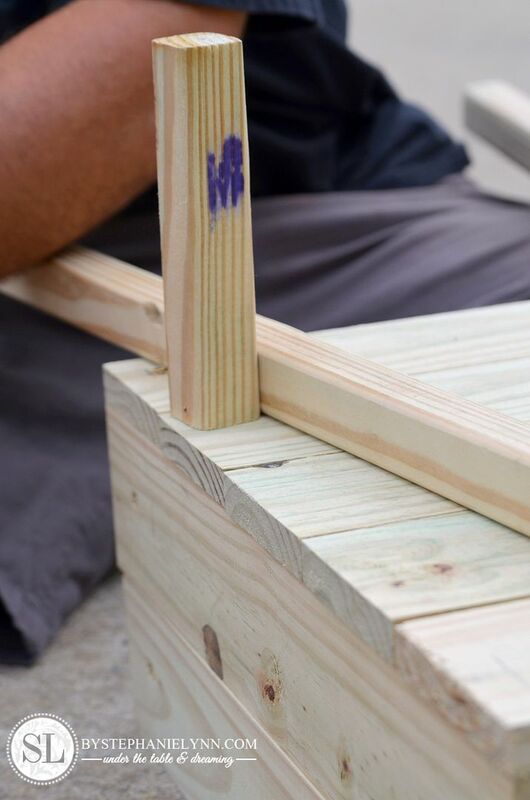 For added support place another screw inside the planter box, screwing directly down into the leg. 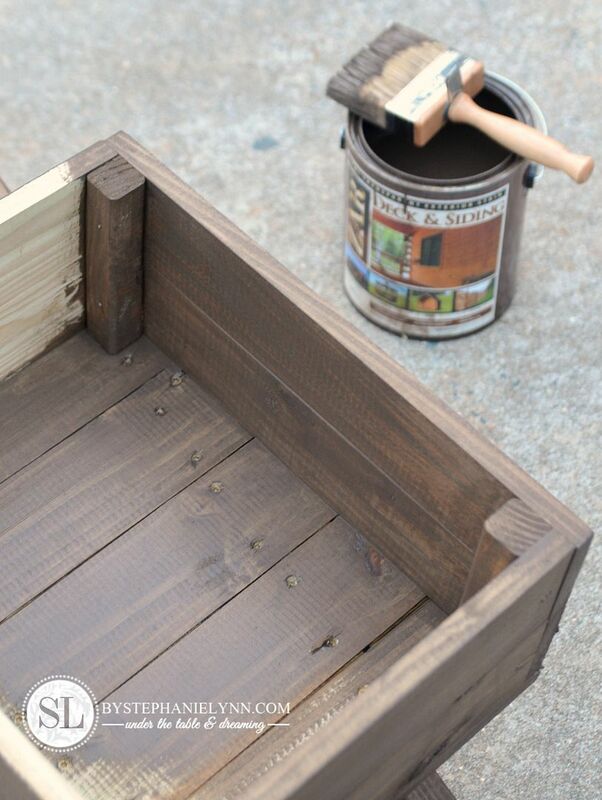 Once the wheelbarrow planter is complete it should be painted or stained, adding an additional level of protection to the wood. Prior to doing so the pressure treated wood should be ‘weathered’. 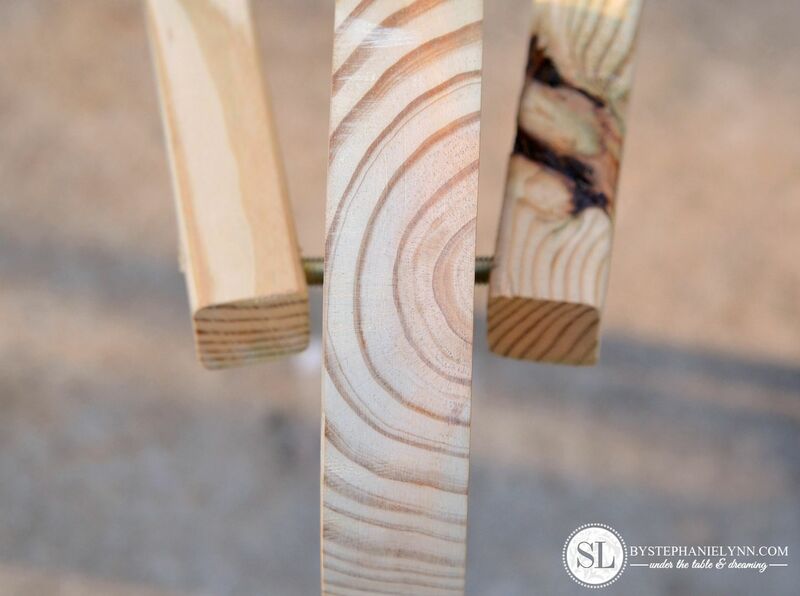 Weathering the wood allows the wood to dry out and the pores to open up making it more acceptable for the new paint or stain finish to penetrate the wood. How long you should wait to apply paint or stain will vary depending upon where you live and the weather conditions. Applying a finish prior to weathering the wood could lead to coating failure and surface adhesion problems. One of the safest ways to test pressure treated wood for moisture is by using a moisture meter. 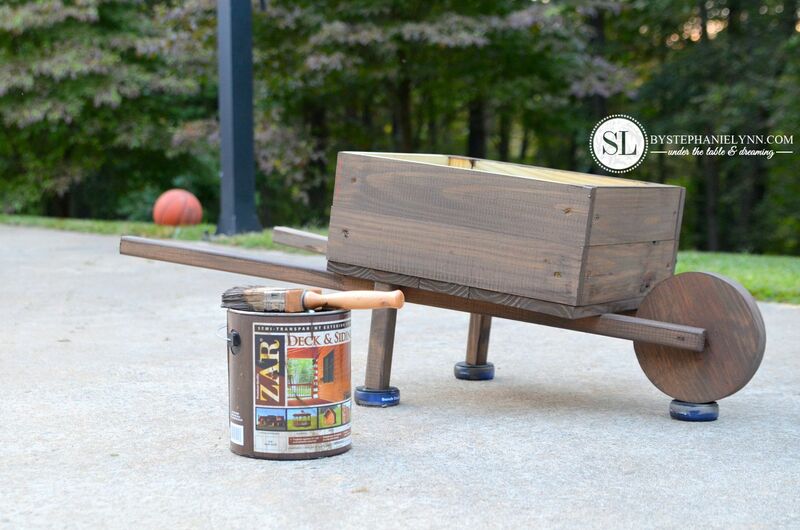 Since we love the wood grain look we decided to stain the wheelbarrow planter with ZAR Deck and Siding Stain. It’s the same Manor Brown color we used last month for Staining our Adirondack Chairs. 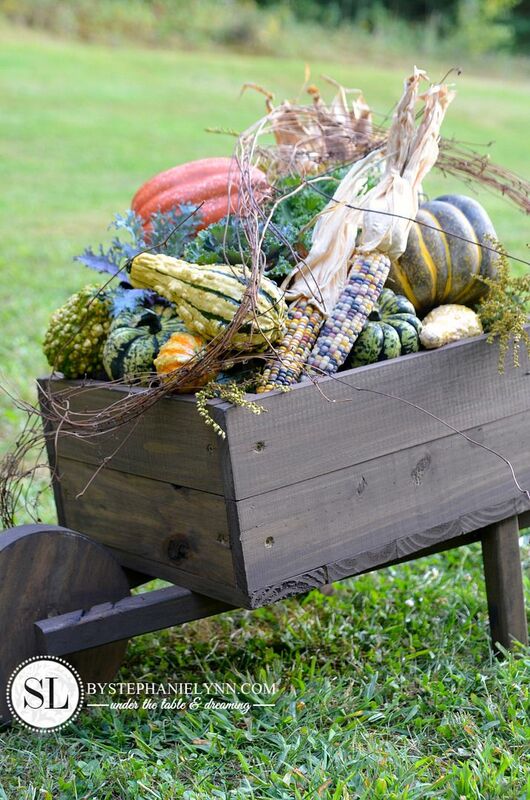 Once dry we filled the wheelbarrow with festive fall findings including pumpkins, gourds, corn, fresh kale and cabbage along with some dried grapevine vines. Mums can also be planted directly in the wheelbarrow planter – just be sure to drill a few holes through bottom of the planter for adequate water drainage. While I love all of the seasons – there is just something special about this time of year! You’re very lucky to have a man, with all the tools, to make this for you! 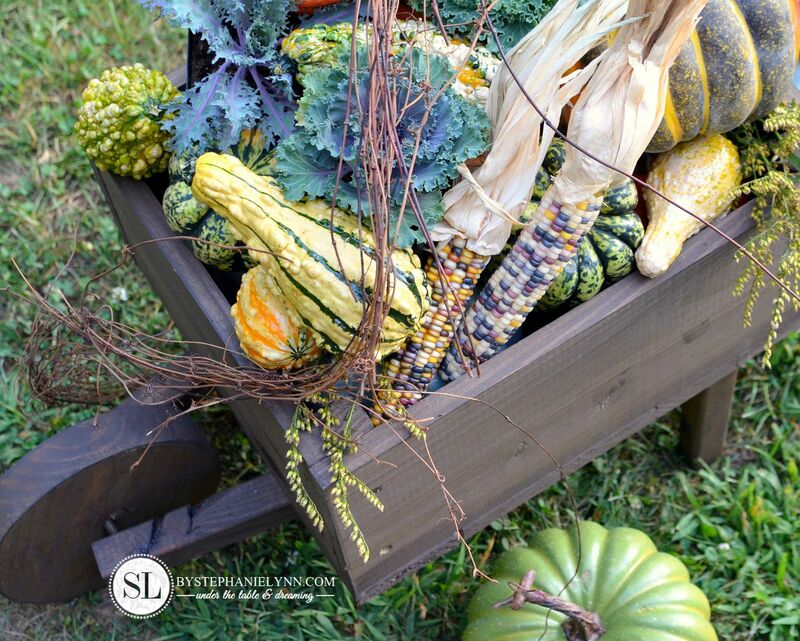 I love the variety of gourds you have in it on display….enjoy it! Oh that’s perfect! I’m swooning a little:) last year I did a wheelbarrow (not a cute wooden one though) in Christmas lights with faux presents. It was very cute for Christmas. One year I wrapped lights around a bicycle too…it was pretty neat looking. Just wanted to leave a note & tell you I love your wheelbarrow display! This is absolutely gorgeous! What a great tutorial! I re-shared on my blog, loved it so much! Love it! thanks so much for tutorial, I just might have to run to the home improvement store to get the supplies and make this…yours turned out wonderful! Very clear, lovely photos. Great DIY. Many thanks!